Malaysia and Singapore have reached an agreement regarding Malaysia's request to postpone the High Speed Rail (HSR) linking the two countries without compensation. According to local media, Malaysian Economic Affairs Minister Mohamed Azmin Ali said that Singapore has agreed to put the project on hold "indefinitely", and there will be no need for Malaysia to pay compensation during the period. He added that the project may be resumed when the Malaysian economy is improved, adding that in case the project is cancelled, Malaysia will have to make the compensation, which is around 500 million ringgit (123.1 million USD), to Singapore. The governments of Malaysia and Singapore signed a legally-binding pact on the project in December 2016 under the administration of former Prime Minister Najib Razak with total investment of about 17 billion USD. Both sides called for tender last year. 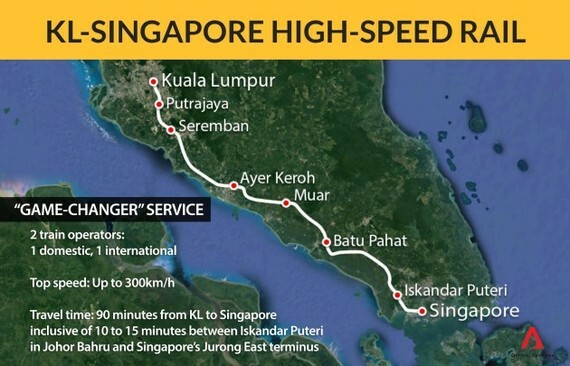 The high speed rail project would cut travel time between Kuala Lumpur and Singapore to 90 minutes once in operation.